In a quiet coffee shop in Charlotte a group of women gather regularly to play what they refer to as “retirement bridge”; basically bridge for retired people. In between hands, during deals, and at break time, their conversations tend to revolve around books being read by their book clubs, upcoming lectures or concerts, and local opportunities for service. 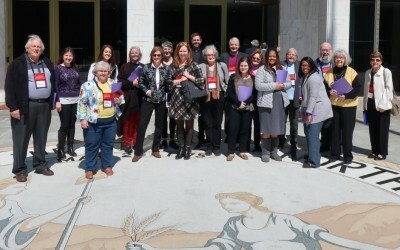 At the end of March, their conversations led Deb Park and Diane Wassum to sign up and attend “Lutherans at the Legislature,” the first Legislative Advocacy Day hosted by the NC Synod. Both Deb and Diane are members of Advent, Charlotte, where they had participated in a small group study on racial justice, in conversations about the ELCA social statements, and in a book study of “The Third Reconstruction” (by the Rev. Dr. William J. Barber II). In addition, they both volunteer when Advent hosts “Room In The Inn,” a program that provides shelter and food for homeless people during the winter months. Jenny Simmons and Ryan Carter were also in Raleigh that day. They both serve on the NC Synod’s Social Justice and Advocacy Ministries team that planned the event. Jenny is from St. Mark’s, Asheville, and is the Grants Management Director for Homeward Bound of Western North Carolina. Ryan is from Christ-Providence, Charlotte, and is the Advocacy and Communications Outcomes Associate at Habitat Charlotte. Diane was excited to learn that the NC Synod’s Social Justice and Advocacy Ministries team is available to help congregations understand and build bridges with their local communities. She and others from Advent, Charlotte, are already working with the team to plan an event to help with community understanding before they host “Room In The Inn” again next winter. Want to know more about Social Justice and Advocacy Ministries in the NC Synod? Follow us on Facebook or contact Deacon GeoRene Jones, Synod Coordinator of Social Justice and Advocacy Ministries. Through the generosity of Mission Support, GeoRene and her team of volunteers are available to help folks across the synod take the next step!